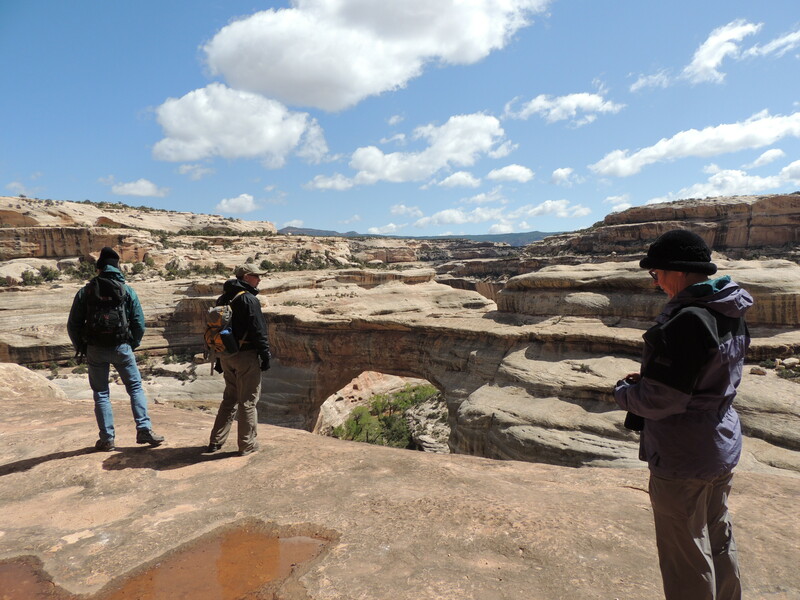 It’s not supposed to be cold and windy in southeastern Utah at the end of April. I’d envisioned clear blue skies, warm sun, and hiking in shorts and short sleeves. What we got was highs in the 40s, and 25 mile an hour winds. But the bright sun made it all OK.
Really, all these layers and it’s almost May? 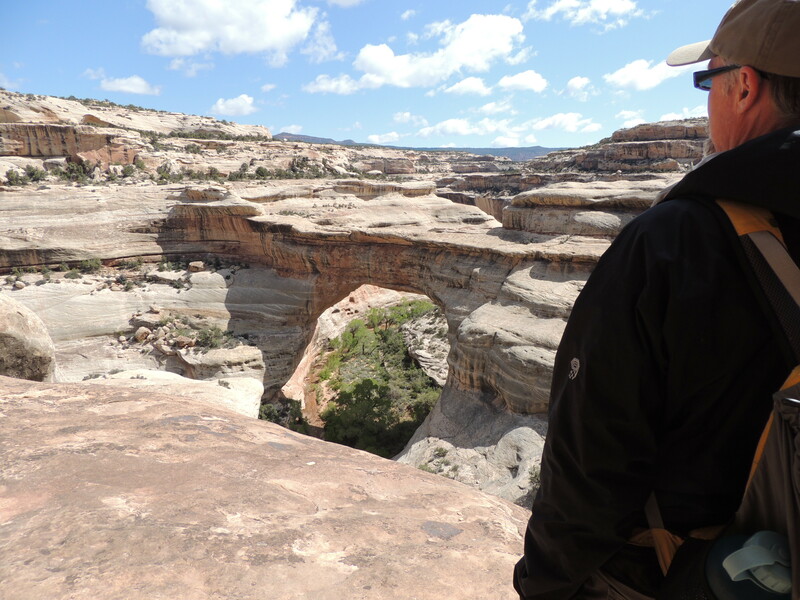 We were at one of my favorite little parks: Natural Bridges. 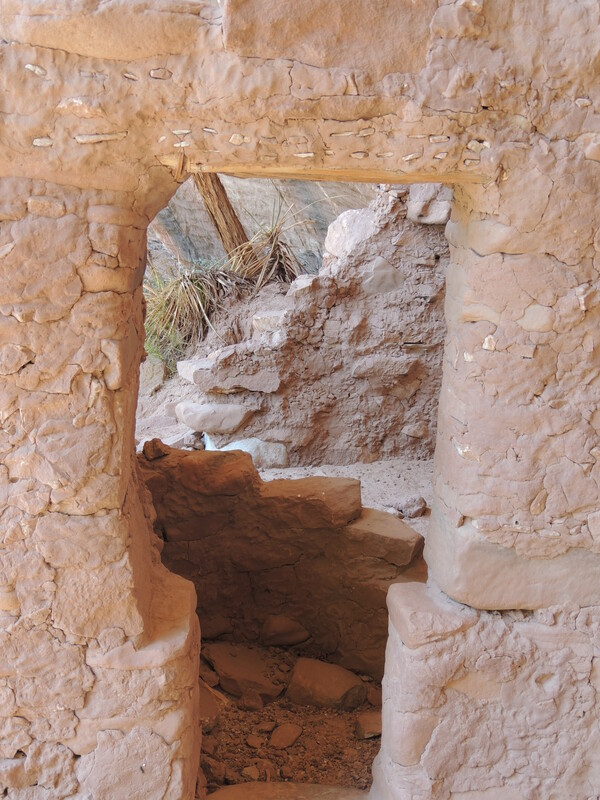 I’d read about a ruin near Sipapu Bridge that the Park Service doesn’t tell you about, and I wanted to check it out. 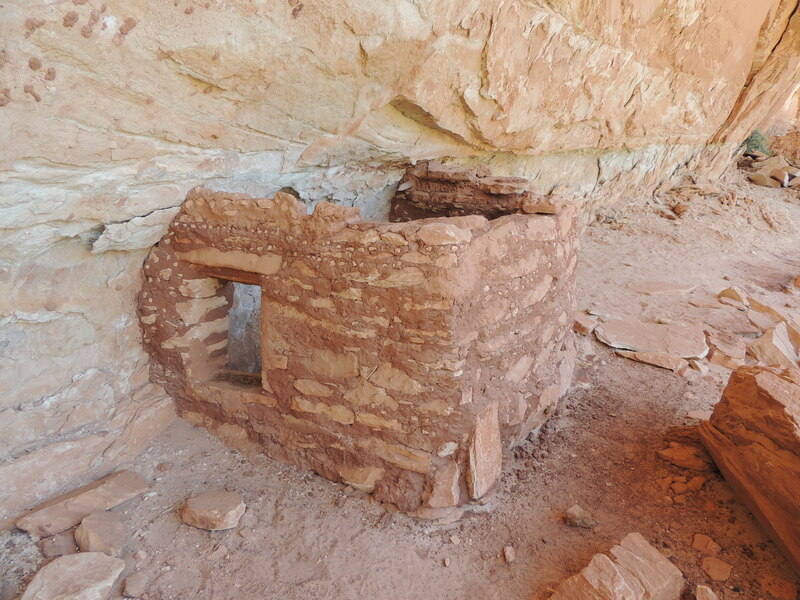 And yes, if you ask about this little ruin at the visitor center they’ll tell you they can’t say anything about it. 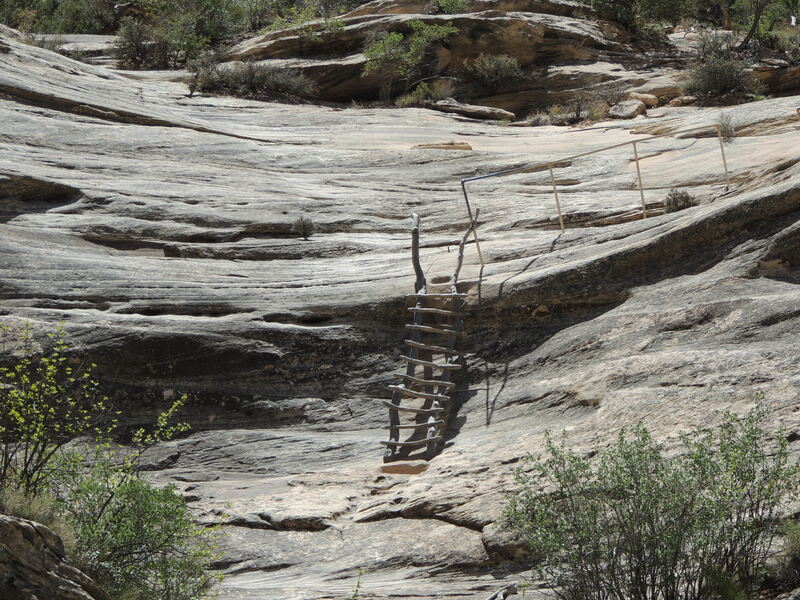 (But it’s not really that hidden, so I’m going to tell you how to get there: go to Sipapu Bridge and take a right – upcanyon. Hike a little less than a mile and you’ll see the ruin on the left.) 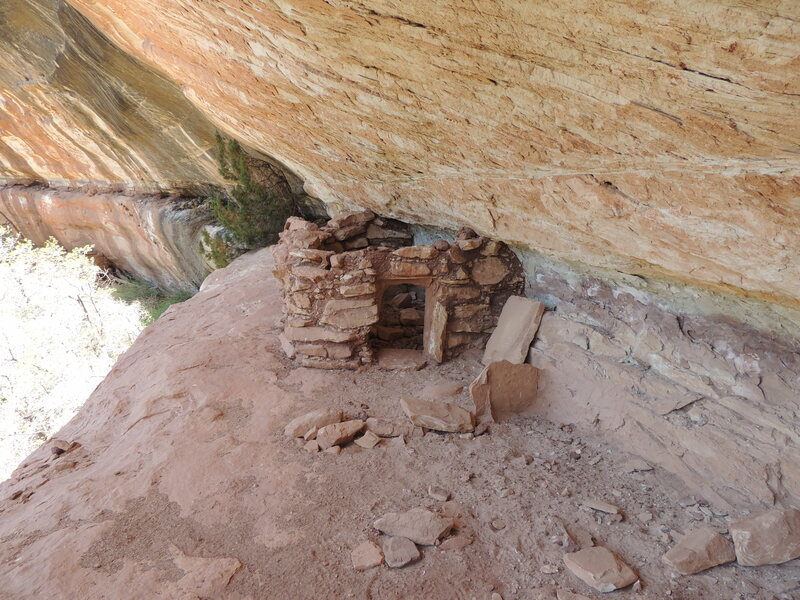 It’s a sweet little ruin, with some nice rock art as well. 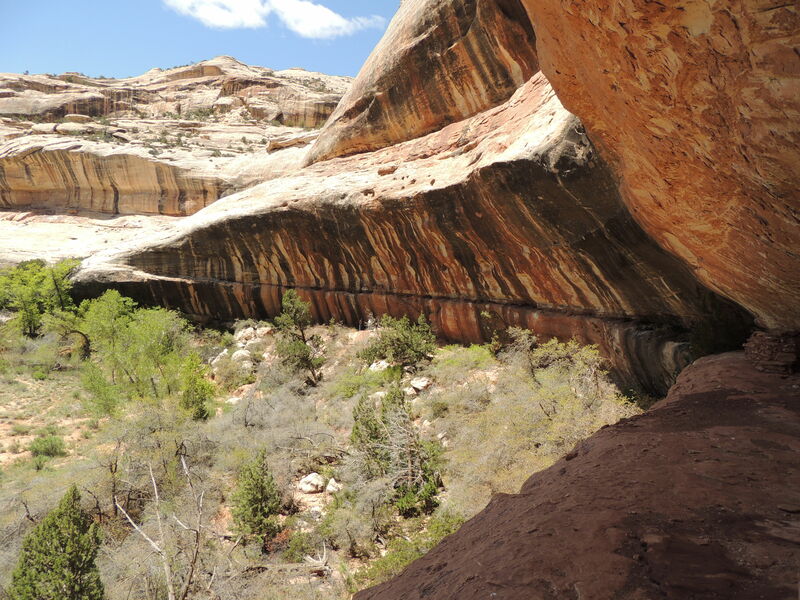 The hike to Sipapu Bridge is fun, too. 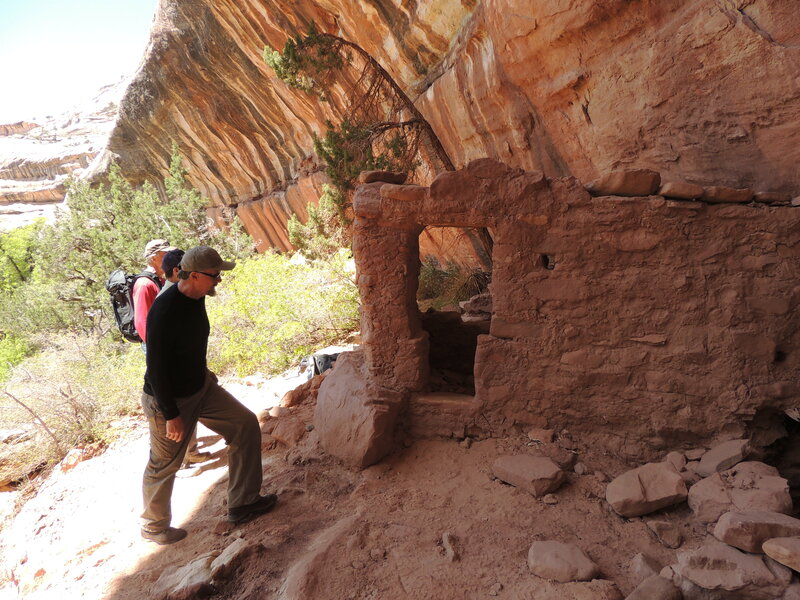 After finding the secret ruin we continued on to Kachina Bridge and then hiked across the mesa top to return to the car, which makes a perfect day hike. You can also take a bigger loop and see all three of the bridges, which is well worth it. 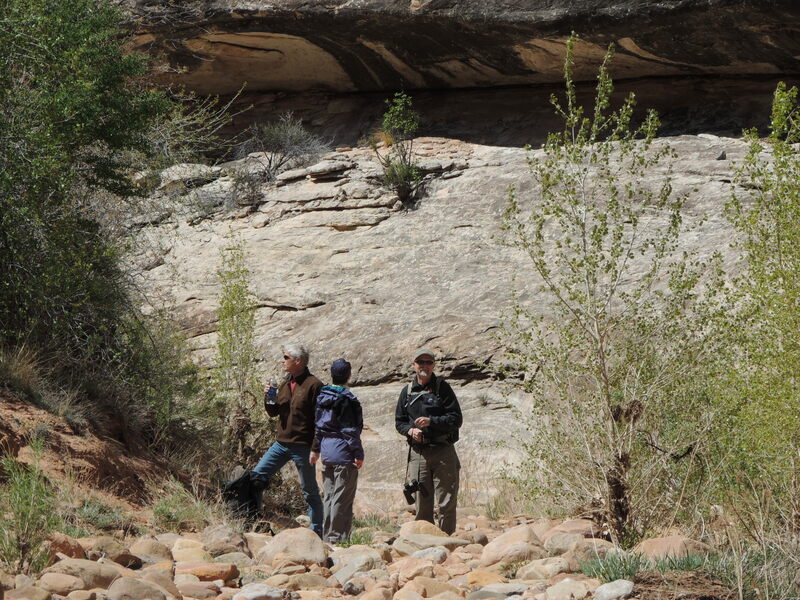 Once we reached the canyon floor the wind calmed down, and we could start shedding layers. 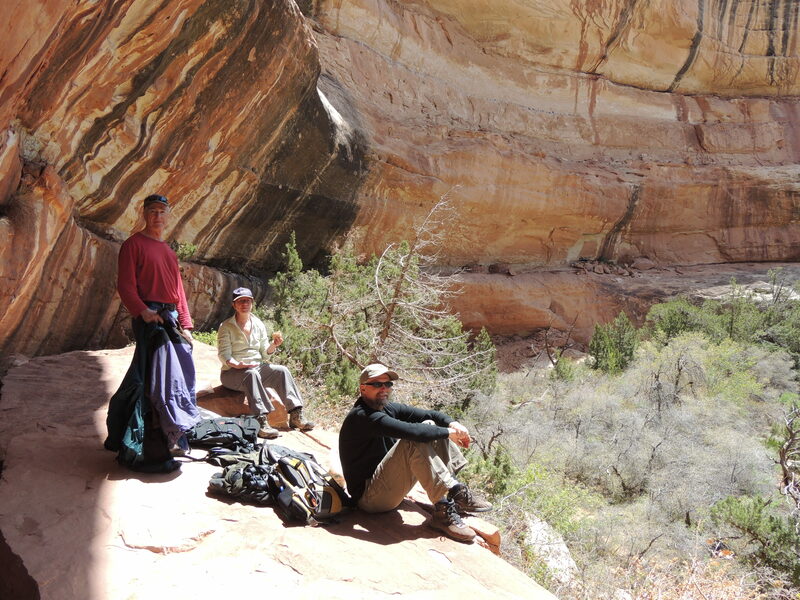 We headed upcanyon, enjoying the warmth and sunlight. 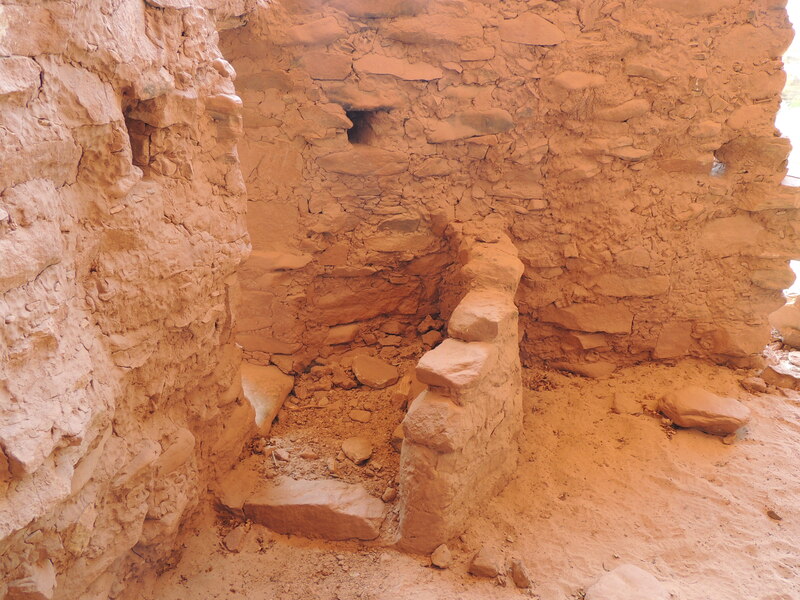 After about 20 minutes we found the hidden ruin. 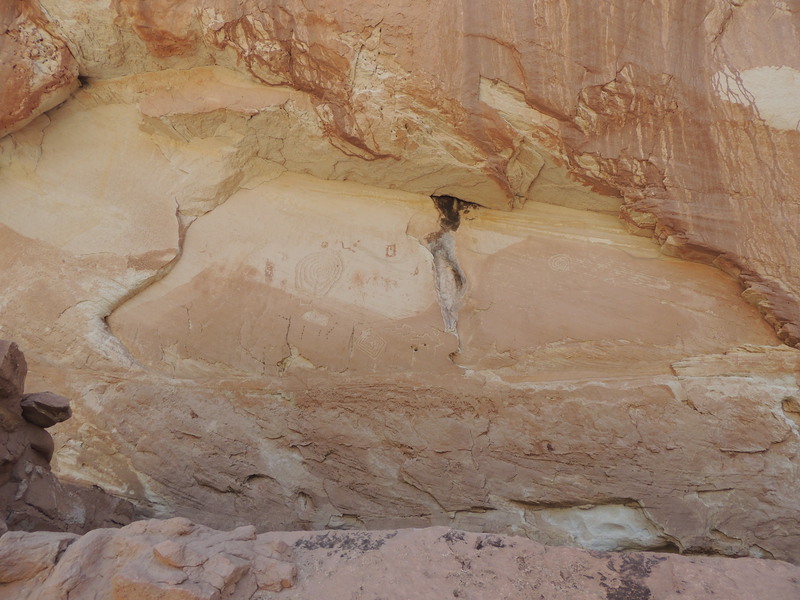 You see the pictographs first. 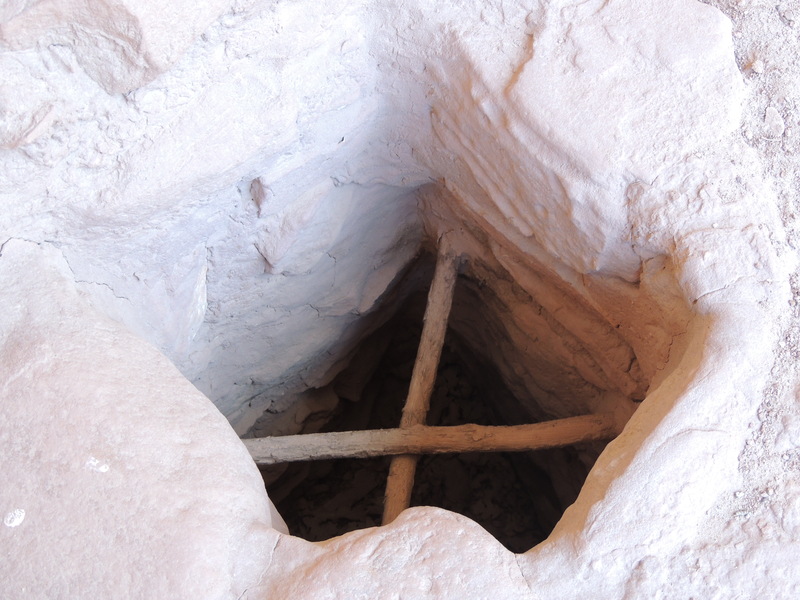 The ruin is fairly small, but it includes some interesting details. 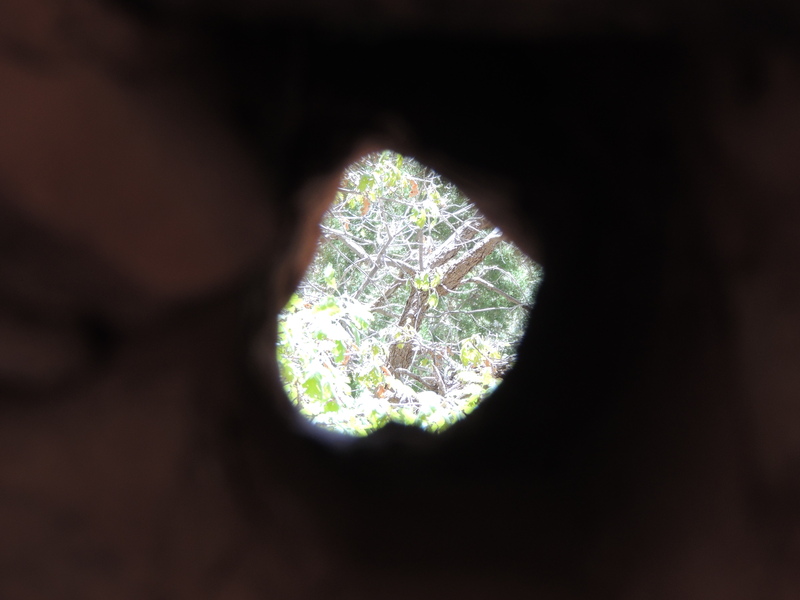 Inside this room is a small enclosure that surrounds a peephole. The ledge makes a dandy picnic spot before exploring the rest of the ruins that are a bit harder to get to. See the door still propped against the wall? Looking at the setting of this little dwelling gives you a good idea of why they chose to live in this spot, doesn’t it? 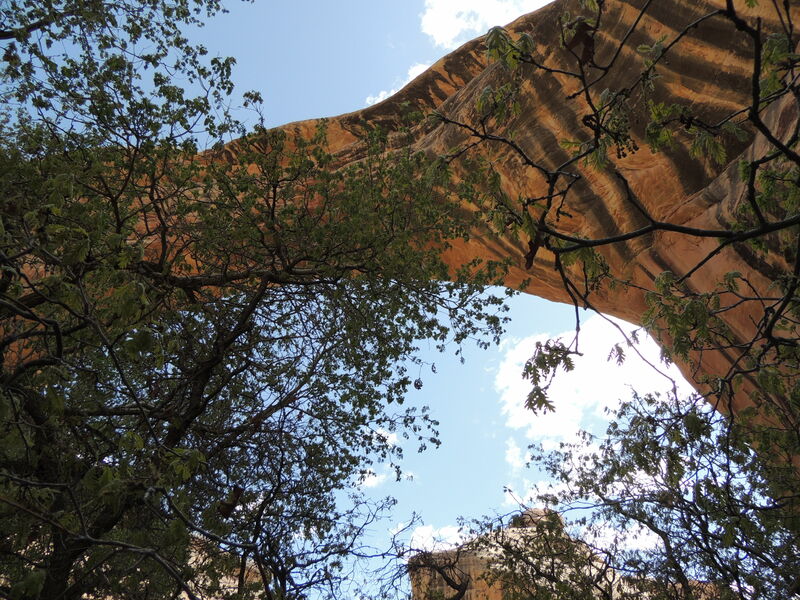 This entry was posted in Hiking, Nature, Outdoors, Southwest hikes and tagged Cedar Mesa hikes, Natural Bridges hikes, Natural Bridges National Monument, Sipapu Bridge. Bookmark the permalink. Whenever I read about secret ruins I think about The Professor’s House. Did you read that in college? I don’t think so. I went on a Willa Cather binge when I lived in Brighton, I remember, and read The Professor’s House then. I need to reread O Pioneers now that I have so more experience with the prairie! We won’t get there this year. Looking forward to northern New Mexico this fall, though. Ah, northern New Mexico in the fall: gorgeous! What a fabulous adventure to hike and find such wonderful ruins. We have some here in Arizona and we just love exploring them. Great photos! They are fun to explore, aren’t they? Thanks. Thanks for taking me on this hike to see places I’ve never been and likely never will be. Those ruins are quite intriguing. They are intriguing, aren’t they? Thanks for the visit. Very interesting stuff. Thanks for sharing. 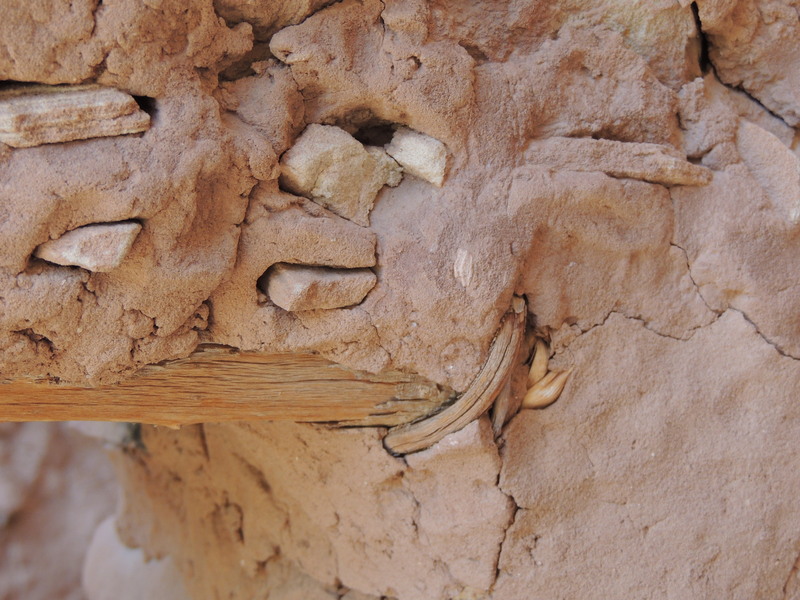 Those “nobody knows” holes were for vigas, horizontal ceiling timbers that project through the walls of the structure. 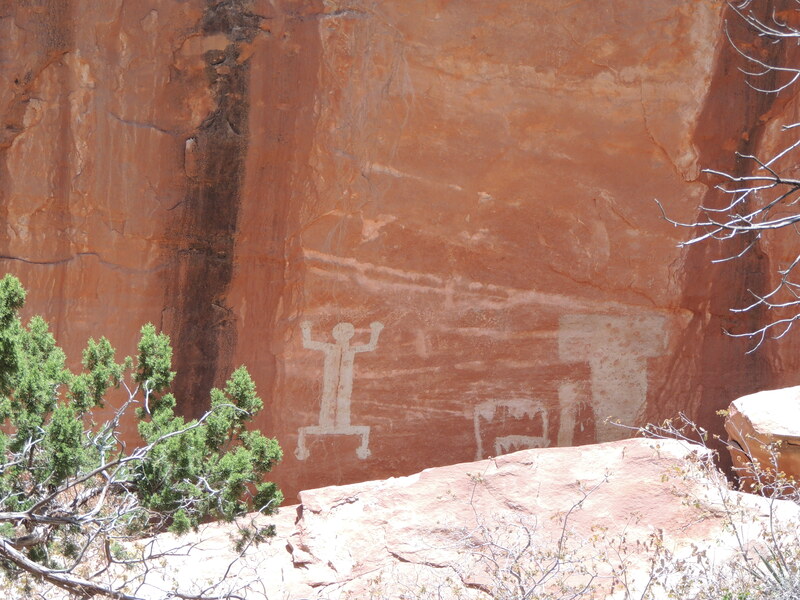 The Spanish adopted the Native American design, hence the term. 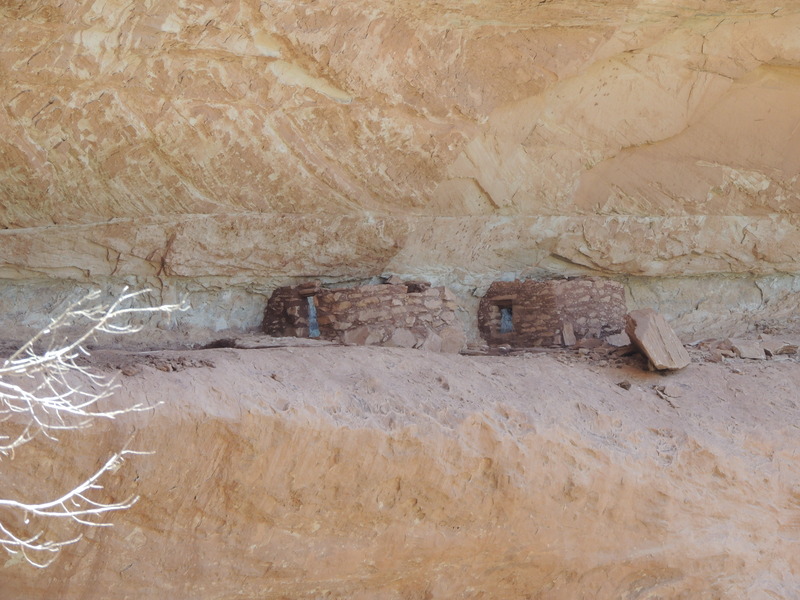 If you had gone just another half mile or so upstream you’d have found an even more impressive ruin with a perfectly preserved kiva. Interesting, thanks! And now I need to go back and check out that second ruin.